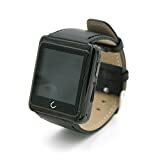 Smart Wrist Watch Phone Mate U10L Bluetooth For Apple IOS iPhone 6 6s 5 5s 4 4s Samsung Android Galaxy S3 i9300 S4 i9500 S5 i9600 NOTE 3 NOTE 4 N9000 HTC ONE M7 M8 HUAWEI XIAOMI LG NEXUS 5 D820 821 Specifications: 1. 100% Brand New. 2. Wristband Material: Synthetic Leather 3. Size of the Dial: 4.5 x 4 cm (1inch=2.54cm) 4. Compact Package. 5. There-axis magnetic sensor. 6. 3D gravity sensor. 7. Special noise reduction Microphone. 8. Synthetic Leather Strap 9. Good compatibility. Multi-Function: E-compass, Find phone, Pedometer, Taking Pictures, Anti-theft, Water-proof, Power-saving, Sleep Quality Monitor (It is water resistant item, a little water is no problem, can not be too much water ) Language support? English, French, Spanish, Polish, Portuguese, Italian, German, Indonesian, Finnish, Turkish, Russian, Arabic, Persian, Hebrew, Thai For IOS iPhone: pls download "lightblue" and "Mediatek SmartDevice" from Apple Store, and please make sure your system is at least IOS 7.1. Note: Due to the difference between different monitors, the picture may not reflect the actual color of the item. We guarantee the style is the same as shown in the pictures. Thank you! Package Includes: 1 x Smart Watch 1 x USB Cable(Not included the charger) 1 x User Manual.